Green is identic with fresh and cool color. Looks calm and bring nature nuance arround. Some people use this color for their house. We often see a house that has painted in green right? So what is the reason of those people by paint their house with green? In our conclusion, may be they want to get the nature touch for their house and several of them complete their garden with plants to make their house more live and feel fresh. Want to decor your house with green touch? We have you something unique but intersting for your house decoration. 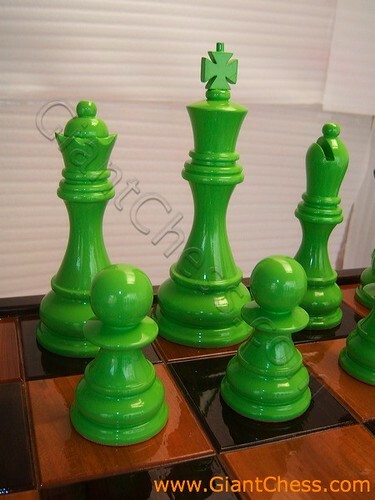 You may dress your house with giant chess pieces which paint in green. You can put them in your living room, library, or your children room. Besides, you can also use it as a gift for your children, family or friends. Those are made from Teak wood material, so it's durable for patio and backyard area.